Modern Aikido has his origins in "Daito-ryu Aikijutsu", founded probably by Prince Teijun, the sixth son of Emperor Seiwa (850 - 880 AD). Through his son it passed on to the next generations of the Minamoto family. This art came to Shinra Saburo Yoshimitsu, brother of Yoshiie Minamoto, a man of exeptional skill; the name of the palace where he lived, "Daito Palace", gave the name to his style of Aikijutsu. His son Yoshikiyo lived in Takeda in the province of Kai, so that he became known by this name. Since this period these techniques remained a secret art of the Takeda family until 1868, during the Meiji period, when for the first time Sokaku Takeda - then at the head of the family - began to teach this art outside the Takeda household. One of Takeda Sensei's students - the most outstanding one - was Morihei Ueshiba; he unified Daito Ryu with other schools of Jujutsu and with Kenjutsu, the art of Sword-fighting, creating modern "Aikido". 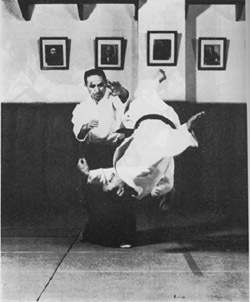 Shioda Gozo Sensei (1915 - 1994), the founder of Yoshinkan Aikido , was one of the first students of Ueshiba Sensei. He entered Ueshiba Sensei's Dojo at the age of 18 and for 8 years he dedicated himself solely to the practise of Aikido. In 1954 he opened the first Yoshinkan Dojo. After his death, his teachings are being faithfully carried on by Kai Kuniyuki Sensei through the Nippon Budoin Seibukan. 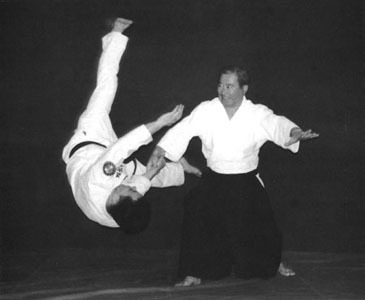 A popular Aikido axiom is that the weak can control the strong through the use of the technique. But Aikido is more than simple phisical skill: aiming to the purpose of being in harmony with the opponent's power and speed, both our body and our mind must be "flexible". The aikidoka must be aware of his opponent and share his feelings; the initial aim is therefore not to damage, but to cultivate a feeling of "harmony" with the opponent. Circular Movements (En Undo) are the secret of gaining advantage from your enemy's power. Almost none of the Aikido movements follow a straight line: the feet, the body and the arms describe an arc and furthermore they are tridimensional - that's to say they follow the shape of a sphere or, sometimes, of a spiral. The Circular Movements allow the aikidoka to add his weight and his power to his opponent's ones without fearing any harsh collision. - Speed, to follow the opponent movement and avoid his attack. - Concentration of the Energy (Shuchu-Ryoku) in a specific moment and direction. - Timing, to synchronize our movements with the opponent ones. Aikido techniques are classified in the following way: Tachi Waza (standing techniques), Suwari Waza (seating techniques), Hanmi Handachi Waza (mixed techniques - one standing and one seating -). These groups are further divided into Nage Waza (throwing techniques) and Osae Waza (blocking techniques). As Aikido can count over one thousand techniques, it's impossible to give them all a name. Only the basic ones have a specific name: Ikkajo (first type), Nikajo (second type), and so on. This cataloguing makes very difficult for a beginner to understand the essence of a technique by simply hearing its name.